Bigasoft YouTube to iMovie Converter for Mac is the best program to fast import YouTube to iMovie with excellent quality. It can convert YouTube video to iMovie compatible video MP4, MOV. It also can extract audio from YouTube and then convert it to iMovie compatible audio MP3, WAV, AAC and M4A. Besides, it supports importing other video formats including MTS, MKV, FLV and MOD to iMovie readable formats. ...... output effect, shut down computer automatically after conversion, convert files in batches and more with unmatchable conversion speed and excellent output quality. Bigasoft YouTube to iMovie Converter for Mac helps you to fast import YouTube into iMovie by converting YouTube to iMovie compatible format. It also can convert FLV to iMovie compatible format, which helps you fast import FLV to iMovie. It can extract sound tracks from YouTube video and then save in iMovie compatible MP3, WAV, AAC and M4A audio formats. You can convert only your preferred segment by setting the start time and the end time or by dragging the start slider and the end slider. You are able to crop YouTube to remove black bars and focus video with the powerful YouTube to iMovie converter. Qweas is providing links to Bigasoft YouTube to iMovie Converter for Mac 3.4.2.4195 as a courtesy, and makes no representations regarding Bigasoft YouTube to iMovie Converter for Mac or any other applications or any information related thereto. Any questions, complaints or claims regarding this application Bigasoft YouTube to iMovie Converter for Mac 3.4.2.4195 must be directed to the appropriate software vendor. 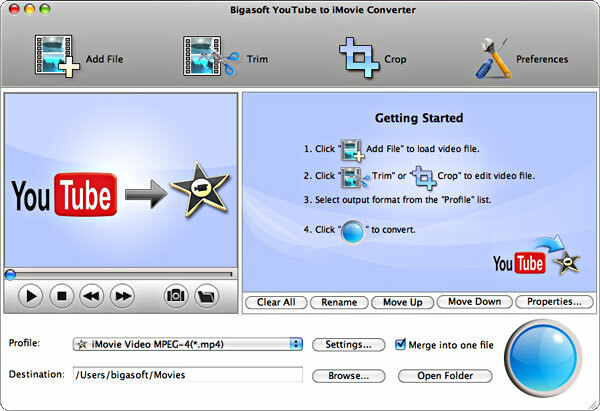 You may click the publisher link of Bigasoft YouTube to iMovie Converter for Mac on the top of this page to get more details about the vendor.